One reason advisors should try to attract attorneys as clients is that attorneys talk to other people about their financial advisor. For the first time, Spectrem’s new Professional Series separates investors from occupations which have previously been combined in Spectrem’s syndicated studies. Whereas professionals such as doctors, lawyers and accountants previously were compared in whole to investors who were educators or senior corporate executives, the Professional Series considers investors from each of the professional occupations singularly. The study on lawyers shows that lawyers are far more likely to find a financial advisor through a recommendation from a business associate far more than all other investors (39 percent to 27 percent). 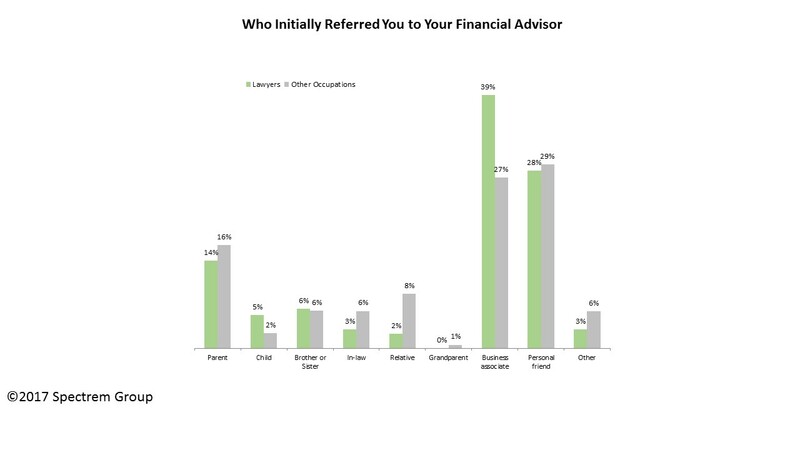 Other investors are more likely to find their advisor through family members. At the same time, lawyers talk to their clients, many of whom have either positive or negative financial issues. Attorneys often provide a connection path between their clients and financial advisors with whom they have a prior relationship, either business or personal. It makes sense in two ways, then, for financial advisors to want to attract lawyers as clients. Perhaps recognizing the value of professional services personnel, attorneys are more likely than other investors to use a financial advisor, and wealthier attorneys are more likely again to use an advisor. A very high 87 percent of Ultra High Net Worth attorneys with a net worth between $5 million and $25 million use an advisor, and 82 percent of Millionaires lawyers with a net worth up to $5 million do so. Female attorneys are even more likely than male attorneys to find their financial advisor through a referral from a business associate, perhaps being another attorney. A startling 43 percent of female attorneys found their financial advisor from a business associate. Another unique aspect of the relationship between attorneys and their financial advisors is that attorneys are not shy regarding their attitude toward advisors fees. Fifty-nine percent of attorneys say they feel the services of a professional financial advisor to be very expensive (compared to 53 percent of all investors) but 43 percent of all lawyers say they don’t care about the fees as long as their assets are growing (compared to 31 percent of all investors. Yet another factor that differentiates lawyers from other investors is that lawyers do not hold in much regard the idea of using a robo-advisor for any investment task. Unlike other investors who have believe robo-advisors can on occasion serve just as well as a human advisor, attorneys are almost united in their regard for human advisors and disregard for automated advisory services. Is “professional courtesy” really a thing? If so, it probably exists between lawyers and financial advisors. The research shows that attorneys have a healthy respect for the work of financial advisors are more likely than other investors to employ the services of an advisor. With that in mind, advisors should consider the attorneys they have on their client list for recommendations. At the same time, advisors should work to discover ways to attract attorneys, not only to work with them as investors but to ply their services for attorneys looking to provide financial and investment services to their own clients.